Self-tanning is great for a little color to give you dark tone. But once in a while, you will have to remove fake tan traces and refresh your skin. When you want to start the week with a fresh look, you must need to remove fake tan traces. 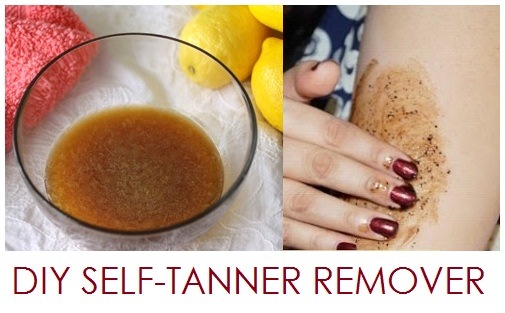 You can make DIY self-tanner remover by using some lemon juice and raw sugar. I suggest that you wet your inner arm, and test it on your underarm first before apply it on your body. Because under arm skin more sensitive than other body. It helps ensure you can tolerate the scrub. This self-tanner remover recipe makes enough for your entire body. Apply it on damp skin. Here is your DIY self-tanner remover recipe. 1. Take a plastic bowl, and combine raw sugar and lemon juice. Remove the lemon seeds and mix together. 2. Scoop the mixture from the bottom of bowl with plastic spoon. Apply it on damp skin before showering or bathing. 3. Rub the mixture on your body where you want to remove the tanning. Don’t rub it forcefully, do it gently. 4. Allow it on your skin for 2 minutes before rinse it with warm water. Also, check out Homemade Self-Tanning Lotion here at @BeautyEnhancers.